Every now and then, someone will invent something that is just, bluntly put, awesome. It could be anything, whether practical or otherwise, as long as you find yourself looking at it and enduring a quiet moment of “…Wow.” Case in point: The 3Doodle pen. It’s a device that’ll allow the user to draw in three dimensional space. Invented by WobbleWorks – a startup founded two years ago by Maxwell Bogue and Peter Dilworth to “create fun, inspiring and innovative products that combine amusing motion and animation with great industrial design at a low cost” – the 3Doodler is described by its creators as “the world’s first and only 3D Printing Pen.” It’s essentially a hand-held miniature 3D printer that produces a thin line that solidifies almost immediately thanks to an in-built fan that cools the ABS plastic as it’s being “drawn” in space. The 3Doodler “draws in the air or on surfaces,” WobbleWorks explains, adding that it is also “compact and easy to use, and requires no software or computers. You just plug it into a power socket and can start drawing anything within minutes.” The invention is an obvious must-have for those interested in 3D printing but don’t want to draft blueprints, and instead just print things out in real time. 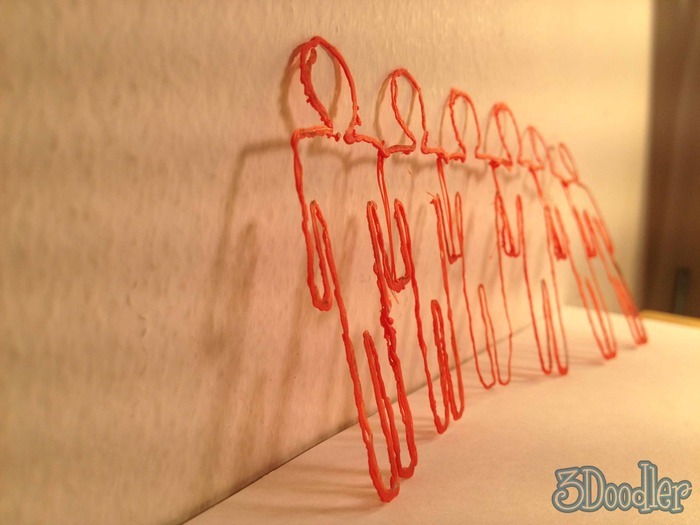 If this sounds too good to be true, you might be slightly comforted to know that there is a catch: WobbleWorks needs your help to make the 3Doodler into a mass-produced reality. The company has set up a Kickstarter project to fund the production of the devices – and it’s one that obviously struck a nerve with the Internet, reaching its initial $30,000 target within a few hours of going live Tuesday. At time of writing, it’s exceeded $628,000; given that the campaign will run until March 25, it’s hard to guess just how much money will be raised by the time it finishes. After all, it’ll only cost you $75 to own one 3Doodler. Clearly, there were more than a few people who had that all important quiet moment of “…Wow” when seeing the 3Doodler for the first time which, in itself, is pretty frickin’ awesome.